Maths is a subject I have always loved. However, many children lack confidence in Maths and therefore dislike or are terrified of it. I think that times tables are vital for children to know really well to be successful in both multiplication and division. Once a child knows their times tables and can access them quickly – its half the battle. I do daily drill practice of the multiples of different numbers. I find this is the best way children can quickly recall their tables. Sometimes we add a song to help children remember. We clap or do actions to make it more enjoyable. I also use games like Shoot – where two children come to the board and face the class and another child writes a problem and says SHOOT! The children quickly spin around and the first person to answer wins and writes the next problem. Another game is Buzz where the children stand in a circle and I give a multiple e.g. 6 and on every multiple of 6 the child must say buzz. If they don’t they are out. Knockout is another game I use. All children stand. I pick two children (matched on ability) and give them a table e.g. 5×6 = and the first child to answer stays standing and the other child sits down. In the classroom, I have a display of the numbers 2-10. 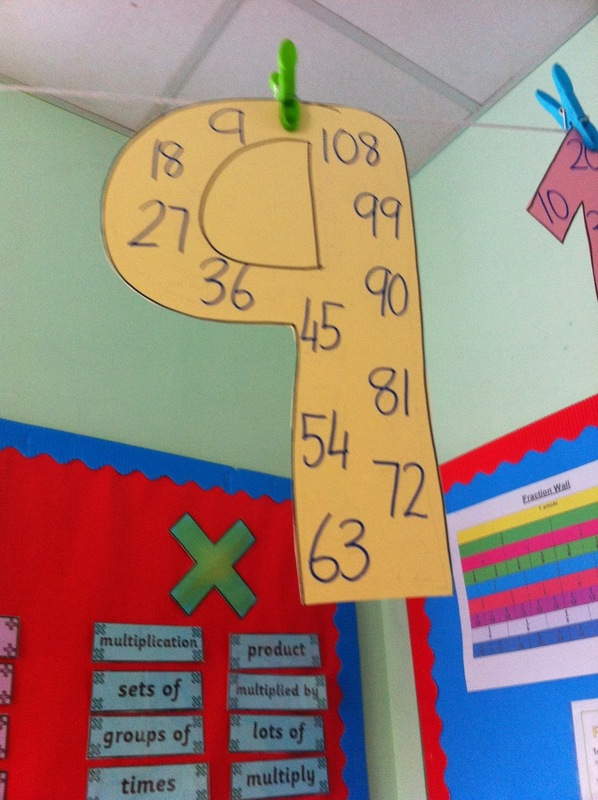 On each number I have written the multiples so children can easily refer to these if they are stuck.